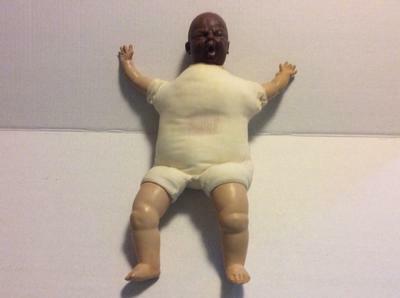 This squalling baby was my doll as a child. I was born in 1946. Within the last 5 years her head color has changed drastically to create what looks like a bi-racial baby. Her limbs are original color but her head has turned very dark. Her head is sticky but I am afraid to try and clean it. Around the base of the neck in back is marked "Coprlast Plastic 49" . The head has metal staples holding it to the body. Any comments or suggestions? What would be her value?